These highlights do not include all the information needed to use FABIOR Foam safely and effectively. See full prescribing information for FABIOR Foam. FABIOR Foam may cause fetal harm when administered to a pregnant woman. Tazarotene elicits teratogenic and developmental effects associated with retinoids after topical or systemic administration in rats and rabbits [see Use in Specific Populations (8.1)]. If this drug is used during pregnancy, or if the patient becomes pregnant while taking this drug, treatment should be discontinued and the patient apprised of the potential hazard to the fetus [see Warnings and Precautions (5.1), Use in Specific Populations (8.1)]. 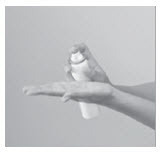 Systemic exposure to tazarotenic acid is dependent upon the extent of the body surface area treated. In patients treated topically over sufficient body surface area, exposure could be in the same order of magnitude as in orally treated animals. Tazarotene is a teratogenic substance, and it is not known what level of exposure is required for teratogenicity in humans [see Clinical Pharmacology (12)]. A negative serum or urine result for pregnancy test having a sensitivity down to at least 25 mIU/mL for human chorionic gonadotropin (hCG) should be obtained within 2 weeks prior to therapy with FABIOR Foam, which should begin during a normal menstrual period for females of childbearing potential. Advise patients of the need to use an effective method of contraception to avoid pregnancy [see Use in Specific Populations (8.1)]. Additional adverse reactions that were reported in <1% of subjects treated with FABIOR Foam included application site reactions (including discoloration, discomfort, edema, rash, and swelling), dermatitis, impetigo, and pruritus. FABIOR Foam is contraindicated in pregnancy [see Contraindications (4)]. There are no adequate and well-controlled studies with FABIOR Foam in pregnant women. 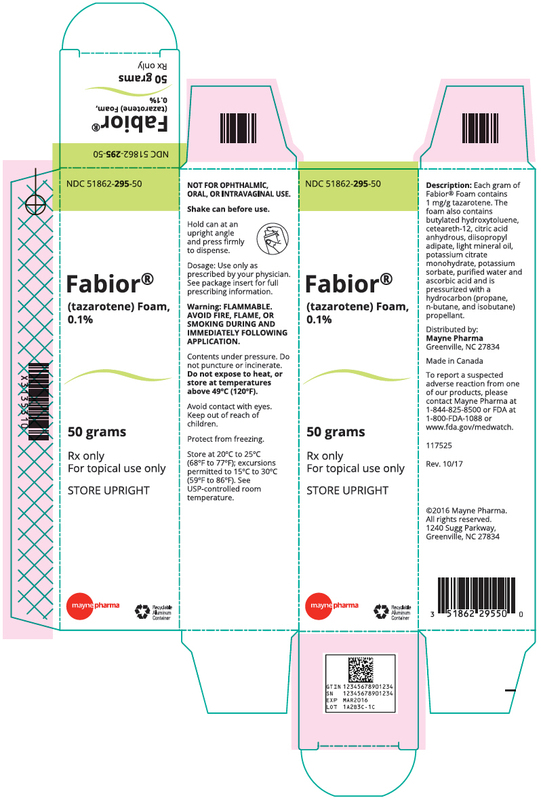 FABIOR Foam is contraindicated in females who are or may become pregnant [see Contraindications (4)]. Females of child-bearing potential should be warned of the potential risk and use adequate birth-control measures when FABIOR Foam is used. The possibility that a female of child-bearing potential is pregnant at the time of institution of therapy should be considered. A negative serum or urine result for pregnancy test having a sensitivity down to at least 25 mIU/mL for hCG should be obtained within 2 weeks prior to therapy with FABIOR Foam, which should begin during a normal menstrual period for females of childbearing potential. Systemic exposure (AUC) to tazarotenic acid at topical doses of 0.25 mg/kg/day tazarotene in a gel formulation in rats and rabbits were 15 and 166 times, respectively, the AUC in acne patients treated with 2 mg/cm2 of FABIOR Foam 0.1% over a 15% body surface area. As with other retinoids, when tazarotene was administered orally to experimental animals, developmental delays were seen in rats, and teratogenic effects and post-implantation loss were observed in rats and rabbits at doses 13 and 325 times, respectively, the AUC to tazarotenic acid in acne patients treated with 2 mg/cm2 of FABIOR Foam 0.1% over a 15% body surface area. In female rats orally administered 2 mg/kg/day tazarotene from 15 days before mating through gestation day 7, a number of classic developmental effects of retinoids were observed including decreased number of implantation sites, decreased litter size, decreased numbers of live fetuses, and decreased fetal body weights. A low incidence of retinoid-related malformations was also observed. AUC in rats was 42 times the AUC in acne patients treated with 2 mg/cm2 of FABIOR Foam 0.1% over a 15% body surface area. Excessive topical application of FABIOR Foam may lead to marked redness, peeling, or discomfort. [see Warnings and Precautions (5.2)]. Management of accidental ingestion or excessive application to the skin should be as clinically indicated. The mechanism of tazarotene action in acne vulgaris is not defined. However, the basis of tazarotene's therapeutic effect in acne may be due to its anti-hyperproliferative, normalizing-of-differentiation and anti-inflammatory effects. Tazarotene inhibited corneocyte accumulation in rhino mouse skin and cross- linked envelope formation in cultured human keratinocytes. The clinical significance of these findings is unknown. Systemic exposure following topical application of FABIOR Foam 0.1% was evaluated in one trial. Patients aged 15 years and older with moderate-to-severe acne applied approximately 3.7 grams of FABIOR Foam 0.1% (N = 13) to approximately 15% body surface area (face, upper chest, upper back, and shoulders) once daily for 22 days. On Day 22, the mean (±SD) tazarotenic acid Cmax was 0.43 (±0.19) ng/mL, the AUC0-24h was 6.98 (±3.56) ng∙h/mL, and the half-life was 21.7 (±15.7) hours. The median Tmax was 6 hours (range: 4.4 to 12 hours). The AUC0-24h for tazarotenic acid was approximately 50-fold higher compared with the parent compound tazarotene. The mean (±SD) half-life of tazarotene was 8.1 (±3.7) hours. A long-term study of tazarotene following oral administration of 0.025, 0.050, and 0.125 mg/kg/day to rats showed no indications of increased carcinogenic risk. Based on pharmacokinetic data from a shorter-term study in rats, the highest dose of 0.125 mg/kg/day was anticipated to give systemic exposure in rats approximately 2 times the AUC in acne patients treated with 2 mg/cm2 of FABIOR Foam 0.1% over a 15% body surface area. A long-term topical application study of up to 0.1% tazarotene in a gel formulation in mice terminated at 88 weeks showed that dose levels of 0.05, 0.125, 0.25, and 1 mg/kg/day (reduced to 0.5 mg/kg/day for males after 41 weeks due to severe dermal irritation) revealed no apparent carcinogenic effects when compared with vehicle control animals. AUC at the highest dose in mice was 49 times the AUC in acne patients treated with 2 mg/cm2 of FABIOR Foam 0.1% over a 15% body surface area. No impairment of fertility was observed in rats when male animals were treated for 70 days prior to mating and female animals were treated for 14 days prior to mating and continuing through gestation and lactation with topical doses of tazarotene gel up to 0.125 mg/kg/day. Based on data from another study, the systemic drug exposure at the 0.125 mg/kg/day dose in rats would be equivalent to 7.6 times the AUC in acne patients treated with 2 mg/cm2 of FABIOR Foam 0.1% over a 15% body surface area. No impairment of mating performance or fertility was observed in male rats treated for 70 days prior to mating with oral doses of up to 1 mg/kg/day tazarotene. AUC at the highest dose in rats was 23 times the AUC in acne patients treated with 2 mg/cm2 of FABIOR Foam 0.1% over a 15% body surface area. No effect on parameters of mating performance or fertility was observed in female rats treated for 15 days prior to mating and continuing through gestation day 7 with oral doses of tazarotene up to 2 mg/kg/day. However, there was a significant decrease in the number of estrous stages and an increase in developmental effects at that dose [see Pregnancy (8.1)]. AUC at the highest dose in rats was 42 times the AUC in acne patients treated with 2 mg/cm2 of FABIOR Foam 0.1% over a 15% body surface area. Reproductive capabilities of F1 animals, including F2 survival and development, were not affected by topical administration of tazarotene gel to female F0 parental rats from gestation day 16 through lactation day 20 at the maximum tolerated dose of 0.125 mg/kg/day. Based on data from another study, the AUC in rats would be equivalent to 7.6 times the AUC in acne patients treated with 2 mg/cm2 of FABIOR Foam 0.1% over a 15% body surface area. In 2 multi-center, randomized, double-blind, vehicle-controlled trials, a total of 1,485 subjects with moderate-to-severe acne vulgaris were randomized 1:1 to FABIOR Foam or vehicle applied once daily for 12 weeks. Acne severity was evaluated using lesion counts and the 6-point Investigator's Global Assessment (IGA) scale (see Table 2). At baseline, 80% of subjects were graded as "moderate" or Grade 3 and 20% were graded as "severe" or Grade 4 on the IGA scale. At baseline, subjects had an average of 79.8 total lesions of which the mean number of inflammatory lesions was 31.9 and the mean number of non-inflammatory lesions was 47.8. Subjects ranged in age from 12 to 45 years, with 860 (58%) subjects aged 12 to 17 years; 428 (29%) subjects aged 18 to 25 years; 143 (10%) subjects aged 26 to 35 years and 54 (4%) subjects aged 36 to 45 years. Subjects enrolled in the trials by race were white (77%), black (15%), Asian (4%), and other (4%). Hispanics comprised 18% of the population. An equal number of males (49%) and females (51%) were enrolled. Treatment success was defined as a score of "clear" (Grade 0) or "almost clear" (Grade 1) and at least 2-grade improvement from the baseline score to Week 12. 1 Almost clear Rare non-inflammatory lesions with no more than rare papules. FABIOR is a licensed trademark of Mayne Pharma LLC used under license to Mayne Pharma Inc.
are pregnant or plan to become pregnant. See "Who should not use FABIOR Foam?" If you are a female and have menstrual periods, begin using FABIOR Foam during a normal menstrual period to help assure that you are not pregnant when you begin use. See "Who should not use FABIOR Foam?" Do not use FABIOR Foam during pregnancy. See "Who should not use FABIOR Foam?" How should I s tore FABIOR Foam? FABIOR is a registered trademark of Mayne Pharma LLC.